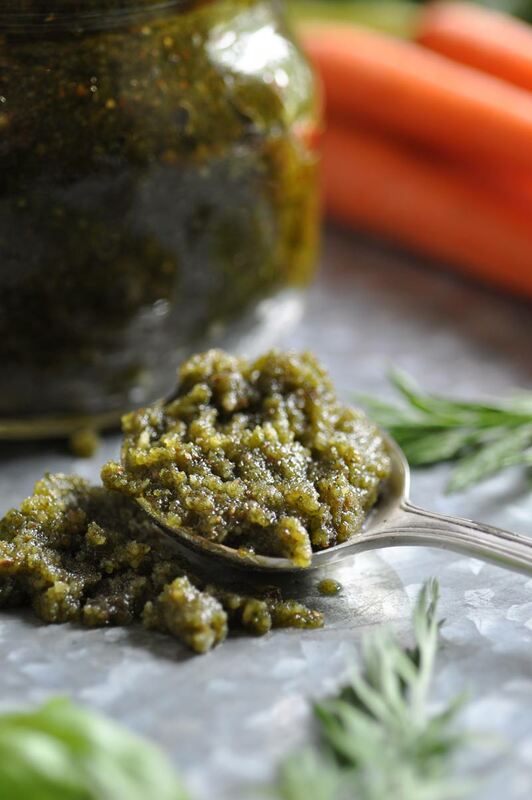 A bright, fresh, and super easy carrot top & almond pesto. You can eat it as a dip or use it as a sauce for pasta or any grain. 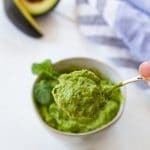 Next to hummus, pesto is one of my favorite foods. I eat it as a dip, as a spread, and as a sauce to smother a big ol’ batch of pasta. For real, what could be better than spaghetti or penne noodles dripping with delicious and garlicky pesto? Not much. Not much at all. 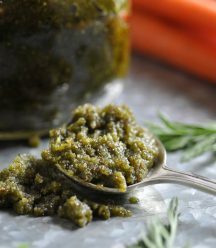 This magical pesto is a twist on the typical basil and pine nuts because it’s made with carrot tops, you know, the long shaggy greens stems that are attached to carrots, and almonds. Did you know that you can eat carrot greens? You can (unless you’re allergic to carrots or carrot tops, then you shouldn’t), and it’s a great way to reduce food waste. The first thing that you’ll want to do is make sure that you buy organic. The idea of pesticides soaking into my greens, and my root vegetables, is an uncomfortable thought, so I buy organic whenever I can, especially if the produce doesn’t have a thick skin that you peel away, such as avocado, bananas, or melon. Cut the greens away from the carrots and soak them in a bowl of clean water. Swish them around in the water to remove any dirt that may be stuck to the leaves. Rinse well and pat dry. Toast a couple of cups of raw almonds in a skillet. 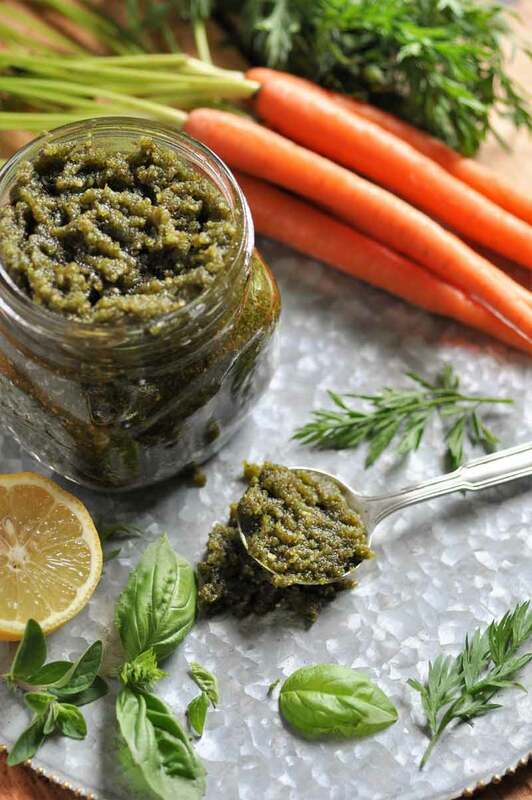 Put the almonds, carrot top greens, basil, oregano, garlic, olive oil, vegan parmesan, lemon juice, and sea salt in a food processor and grind into a perfectly delicious pesto. Store it in an airtight container in the refrigerator for up to 5 days. 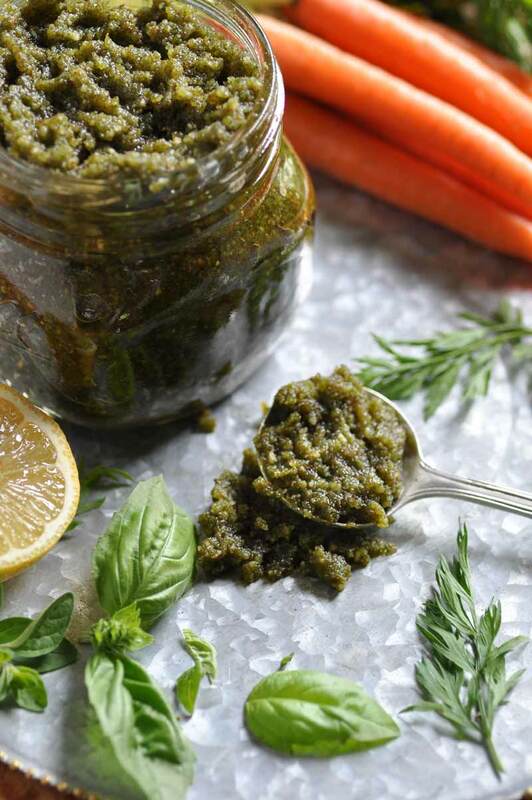 A delicious, savory, and easy pesto made with carrot top greens and almonds. Heat a skillet on medium heat and add the almonds. Toast for approximately 4 minutes, or until they begin to brown. Stir frequently. Let cool for 5 minutes. Remove the carrot top greens from the carrots and soak in a large bowl of water. Swish the greens to remove any dirt that’s stuck to the leaves. 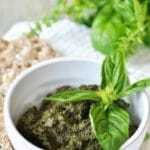 Rinse well and pat dry , coarsely chop, and place in your food processor with the almonds, basil, oregano, garlic, olive oil, Parmesan, sea salt, and lemon juice. Process for approximately 30 seconds, scrape the sides, and process for another 30 seconds, or until it is a thick, slightly oily, paste. Add more salt and/or garlic if desired and process again. Do not eat if you're allergic to carrots or carrot top greens. This sounds great, love the use of carrot greens. I've been putting them in smoothies, but this is much more fun! I love that you are using carrot greens! They're so fun, and this pesto looks awesome. Thanks, Becky! I don't know what took me so long. Sounds delicious. 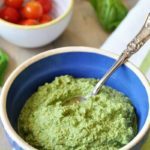 Pesto is one of my favorite things too - even MORE than hummus! I love all kinds of pesto, but I've never thought to make it with carrot tops. Such a genius idea! I feel guilty for throwing out the carrot greens all these years! 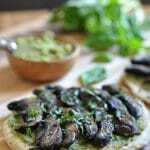 I've tried adding them to smoothie and didn't care for the taste, but I bet they work great in savory applications like pesto. I haven't tried them in a smoothie, I'd imagine that they would be bitter. Definitely try them in pesto with a variety of fresh herbs and garlic, they're so good! I honestly did NOT know the greens were edible! (I somehow was under the impression they were poisonous - so funny where we get ideas?) I am intrigued by the pesto! This is such a great no waste recipe and reminds me that I need to pick up a carrot bunch sometime soon! I get in the habit of buying the organic carrots at TJ's, which are topped. This is so different and creative, I would never even consider using the carrot tops before! Wow! Great idea Linda!